Originally uploaded by Wendy Shaffer. I took a photo of some of my farmers' market bounty last Sunday, but didn't get around to posting until today. Some teeny tiny baby Asian eggplant (the smallest ones were just a little bigger and thicker than one of my fingers). The eggplant and some of the basil went into a really yummy fritatta. A bit more basil went into assorted salads, but I wasn't able to use it all up before it wilted. Next time I buy basil at the farmers' market, I should make a big batch of pesto. We've eaten half of the apricots, and most of the cherries, but the bulk of the peaches and nectarines remain stubbornly hard as rocks. 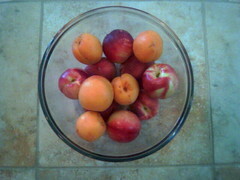 (I did get a single ripe nectarine a couple of days ago, which I ate for breakfast.) I'm bemused - the batch I bought the week before at the farmers' market ripened fully in a few days. If these don't ripen soon, I may end up cooking them. That sounds like a threat, doesn't it? Picture me shaking my finger at my fruit bowl, saying, "Now, if you don't ripen soon, I'll have to cook you!" I have a backlog of things I want to post about - I've tried a couple of interesting recipes in the past week. I'll try to get caught up this weekend, but I probably won't be able to post any more today - we're off to my annual company party soon.